Serving more clients in less time? Yes, that sounds awesome. Making more money? Say hello to coaching income that rocks your world. Delivering coaching that creates everyday miracles in the lives of your clients? Yep, transformational work is your soul of genius so bring it on. So what’s been stopping you from creating a group coaching program that lights you up and helps you make money with ease? How long do I make my group? What should I call it? What content do I need to include? How many people do I need in it and where do I find them? How do I coach people in a group? How do I make sure everyone feels taken care of? That nagging voice? It’s dead wrong. Hi. I’m Kendall SummerHawk, Creator of Multiple 5, 6 and 7-figure Group Coaching Programs and I’m Happy to Share My How-To Secrets With You. How Will Creating A Lucrative + Richly Rewarding Group Coaching Program Help You Be Successful In Your Coaching Business? One-on-One coaching is great, but let’s face it, burn-out is a real thing and it’s not pretty. Plus, even if you charge high-end fees for your coaching, working solely one-on-one limits how much you can make in a month. Creating a group coaching program – even with a small number of participants – can radically increase how much money you make. Imagine serving 5...10... 25 or more clients (whatever number speaks to you) in the time it takes to serve one? Say hello to giving your bottom line a healthy boost... and your time a healthy break! 6-Figure Group Coaching Secrets is an INSTANT ACCESS 4-class online training 100% with me, whether you coach clients online or in person. This training is for coaches who have the desire to create a group coaching program, who are feeling overwhelmed or uncertain about how to design, price and fill a group… and want to know how to confidently deliver their coaching magic to their group participants. This training will give you step by step, what you need to fulfill your desire to create and lead a lucrative, richly rewarding coaching group program. "Kendall's training is so incredibly well organized and presented that it's fail-proof. It's easy to feel confident in what I have to offer knowing that it's based on such a clear layout. The done-for-you materials make it easy to get started right away - taking this training is a no-brainer...it's a fast track to success!" "Kendall’s 6 Figure Group Coaching Program has given me the steps and clarity to create awesome group coaching programs in my niche, with confidence that I have the right content and price as well as a really clear understanding of how to deliver this to best serve my clients. This structure and Kendall’s tips and experience has got me over the line to delivering group programs, which is what I love." "Prior to the group coaching with Kendall, I would have placed my participants on information overload. Now, I include information that’s easy to learn so my participants aren’t placed into a tailspin. In this case, less really is more. Thanks Kendall, for setting up a system that’s easy to follow and understand." This module is all about simplicity and structure so that you’ll feel confident you have the details totally handled with grace and ease. At the end of this module you’ll have your Group Coaching Design DONE. Includes templates and checklists so you are creating your group as you go through the training. This module is all about transforming your expertise into Group Coaching content that delivers awesome value. You’ll learn how to stay completely clear of overwhelm or any temptation to over-deliver. What a relief! At the end of this module you’ll have your Group Coaching Content DONE. This module is all about easily mastering your role as Group Coaching leader with grace and ease. You’ll feel confident creating engagement and positive group dynamics. New to coaching in a group? No worries, because at the end of this module you’ll have your Group Coaching leadership how-to’s DONE. This module is all about the money magic, which means you’re going to feel prepared, ready and confident to price and fill your Coaching Group. At the end of this module you’ll have your Group Coaching Pricing DONE. 91% of participants surveyed rated the step-by-step quality of this training 5 out of 5 stars! To support you in your Group Coaching Secrets success, I’m including 4 Marketing Bonuses perfectly designed to assist you in filling your Coaching Group. Group Coaching clients soooo love to sign up for more of YOU. Imagine what it would be worth to know clearly, how to make the most of your client love, plus to know the best time to invite Group Coaching clients into more coaching with you (hint: it’s a lot sooner than you think). With this bonus you’ll be able to create multiple, healthy paydays that can increase your income from even one Coaching Group by an additional 50% - 100%. What would it be worth to get started filling your group early? Use this checklist to sign clients into your Coaching Group even before you complete your content, giving you immediate income and the excitement of people waiting for your group to start. What would it be worth to feel relaxed and confident leading a discovery/strategy session with a prospective new client? And hearing YES at the end? You’ll love this training because it’s based on relationship (not manipulation). With this you can transform conversations into paying clients, without giving away free coaching. What would it be worth to speak from the heart, rapidly grow your list and sign on new clients when speaking to groups of ANY size? I’ll walk you through, step by step, a simple easy way to create and deliver a list-building signature talk that is powerful and authentic, and that can attract new clients into your Coaching Group. Includes Video Training, sample speaking scripts, handouts step-by-step templates. I believe that leading a coaching group should feel like passionately connecting with your best clients ever… and that multiplying your coaching income should make you feel like doing a happy dance. If you love this topic & my work, this is your chance to be in my energy and learn directly from someone who has led a gazillion lucrative coaching groups. Yes. That’s just a hint at what happens when you add group coaching to your business. Ready to get started? Sign up for 6-Figure Group Coaching Secrets, right now and get INSTANT ACCESS. This training is not about ‘building a massive list’, ‘setting up Facebook ads’, or creating complex funnels. … and it’s about making awesome money in your coaching business because you deserve all this richness in your life. # CLASSES: Training includes 4 online audio training classes, all taught by me. Plus transcriptions and gorgeous companion workbooks that guide you through the training, step-by-step, with grace and ease. LEARN AT YOUR OWN PACE: You get lifetime access to the entire course: training class recordings, transcripts, downloadable handouts, templates, checklists, and bonuses. BONUSES: Register now and get INSTANT ACCESS to the Marketing Bonuses including my Create Your Signature Talk and Discovery Session trainings. Plus, this training includes BONUS Feminine Group Coaching Leadership Mindset audio trainings — 5 minute inspiring audio insights designed to help you become the feminine leader you’re meant to be in the world. Register now and you’ll get INSTANT ACCESS to start your Group Coaching training today. It's really important to me that this training resonates for you. I am 100% confident you're going to love what you're going to learn, AND I want you to feel at ease making this decision. So, I'm giving you 5 days to make your final decision if this valuable, business building content is right for you. If it's not, just let me know, and I'll fully refund your money back — out of my own pocket — and I'll completely remove you from the training program. You have my word on it! 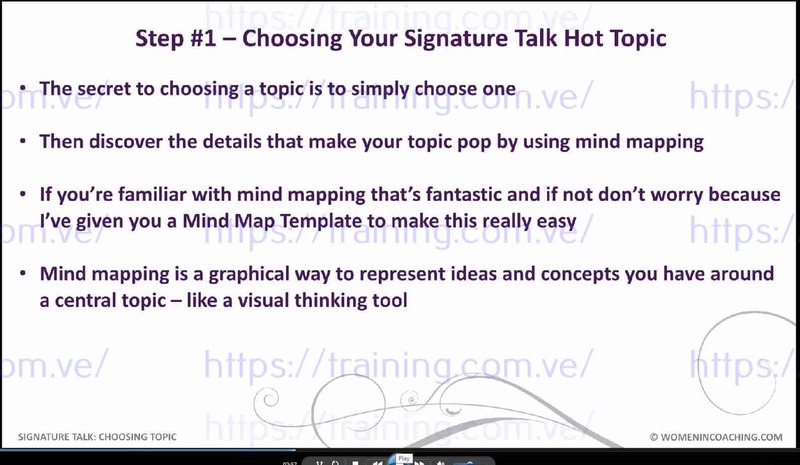 "Even if you have previously developed online courses or programs, this training is stellar! Both the content and support provide a strong foundation for success in developing group coaching programs. The process is step-by-step so what is needed from planning to implementing a group coaching program is all in place when you complete the training. I have spent money and time on many programs, and this is by far, one of the best decisions I made. Thank you, Kendall." "I have gained confidence as a coach and clarity on planning, pricing, attracting high paying clients and running a group coaching program. I am so grateful for the MANY gems provided in 6-Figure Group Coaching Secrets and know I will continue to grow as I implement these powerful strategies in my work!" YES, I WANT YOUR 6-FIGURE GROUP COACHING SECRETS! With this online course you’ll be able to design, price, fill and confidently deliver richly rewarding & lucrative group coaching programs...Even if you are new to leading groups or don’t have a big list. "For years I have wanted to understand how to put together a group coaching program that could really add value to the participants in a way that could 'stick' with them. Kendall's program pulled all the pieces together for me. It was a stretch for me to commit to this initially but now I see this would have taken me a very, very long time to figure out on my own. Excellent! Highly Recommend! It came across your path for a reason, just like it did for me!" Your program has taught me how to set up and start my first group program and your coaching has helped me feel so confident in doing so, I honestly couldn't have done it without this program. Thank you Kendall! "Kendall delivered her group coaching secrets program in her typical power-packed yet graceful way. It’s comprehensive, offers a step by step path to deciding on your program, and then structuring it through to completion. She helps you through every aspect so you can deliver a powerful program and avoid pitfalls along the way. I can’t say enough about Kendall’s coaching and trainings - she is one of a kind in the industry. If you plan to do group coaching or already do, you will receive great value from this course." 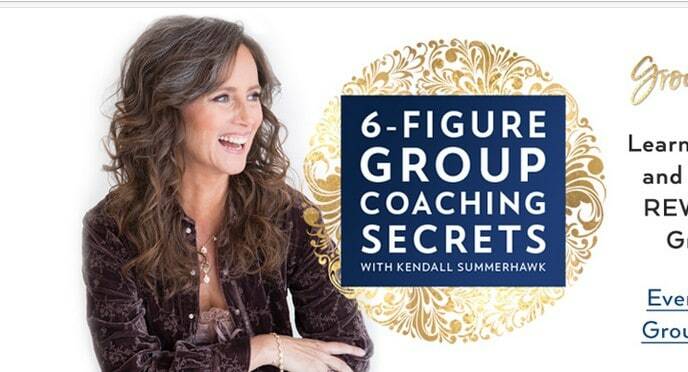 "Kendall's 6-Figure Group Coaching Secrets program was amazing from beginning to end! I highly recommend it for anyone wanting to create and lead group coaching programs. Kendall's program gives you everything you need and more to confidently bring your gifts and talents to the world. Thank you, Kendall!" "Brilliant! Kendall is like no other. She has a way with words and speaking that are easy and enjoyable to absorb. Before this training I was an “information over loader”, always thinking I need to give a ton of value and information, and instead it was creating overwhelm. Having group coaching programs takes me to the next level to easily achieve and surpass the income I desire without burn out of one on one clients. Thank you Kendall! Because of you I have a successful coaching business in just months of starting and am on my way to my seven-figure income dream. Incredible value, AMAZING content, 5-star training!" "Having worked with Kendall on the Certified Money, Marketing and Soul® Coach Training program, her dedication to providing the group with invaluable support and the content is so rich full with tips and great advice. So for me to work with her in the 6-Figure Group Coaching Secrets training was definitely a no brainer. Again I was blown away by the value in the content and I have learned so much. I will be forever grateful to Kendall." "I have taken a lot of courses and feel the training that I get from Kendall is just amazing. She is empathetic and I just love her kindness and her knowledge of her offerings. I just love her style. Everything is done with Grace and ease." "I've been delivering live workshops for years but have never created an online coaching group before. Kendall's process made the thinking very easy so I feel clear and confident that I can do it successfully "with grace and ease". She also included a neat visual for structuring content which I love - I haven't seen this before and I'm sure I can use it in many situations." "Kendall's training as always is very thorough and detailed, helping you to feel confident in your own abilities to create and lead a successful group program." "Kendall has a wonderful way of taking all the mystery and "Hard" out of what she teaches. She gives templates that are fill-in-the-blank with your content and off you go! I am now confident that I will have wonderful group coaching experience, and my members will get everything they came for and MORE!! YAY!!!!" "Kendall does an excellent job of training individuals on how to construct a group coaching program that adds great value to the participants as well as on how to lead the group with confidence." "This training has taken a great deal of the fear out of beginning my own coaching group. Thank you for putting this together!" "This material is gold. I love how clear all the steps are. The information about how to design the content, how to deliver it, how to lead the group and deal with different situations and how to price and market it are truly outstanding. I have already launched my first group virtual workshop and am excited to launch my Branding with Archetypes® 6 week program next week! I'm totally confident that this is going to make a huge difference in my business, both in terms of impact and increased revenue. Thanks so much for creating, yet again, an excellent training Kendall!!" Kendall, you are amazing. There is no one out there that I have found to be not only so incredibly knowledgeable about the topics you teach, but so incredibly generous with how much you share to help other people achieve their highest level of success. Just as I was getting ready to start my own group coaching for the 1st time, your program 6-Figure Group Coaching Secrets came along and gave me all the tricks, mistakes to avoid and the secret elements that can make our group coaching amazing. So grateful. Thank you!